http://www.comfortdying.com/index.htm. Pat McNees’ Dying, Surviving and Aging With Grace offers comprehensive resources and links about illness, death and dying, loss, grief and positive aging — as she says, not necessarily in that order. McNees is also author of the book Dying: A Book of Comfort. CoverAGE newsletter: Aging 2.0, an organization whose mission is to accelerate innovation to improve the lives of older adults, publishes this online newsletter about global technology and design innovations. 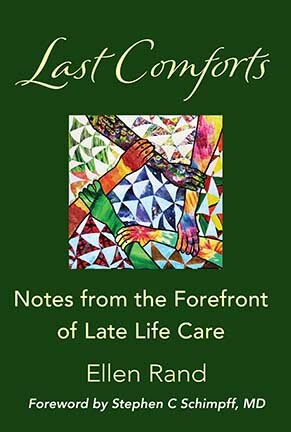 End of Life Decisions: A hospice chaplain, Hank Dunn offers eminently practical advice and compassionate commentary on making difficult choices through the end of life. End-of-Life Nursing Education (ELNEC) Project trains nurses nationally and internationally in different areas of palliative care. Those nurses then go out and train their staff. ELNEC is a collaboration between a team at City of Hope and AACN. GeriPal: A Geriatrics and Palliative Care Blog: A forum for discussion, recent news and research, and freethinking commentary. Get Palliative Care: The Center to Advance Palliative Care’s blog at Get Palliative Care provides excellent guidance, resources and links for consumers with advanced serious illness. The blog sheds light on people’s stories and how palliative care has helped them. Health AGEnda: The John Hartford Foundation apprises readers about its philanthropic work in aging health issues and innovations. Medical Futility: Attorney and law professor Thaddeus Pope tracks judicial, legislative, policy and academic developments concerning medical futility and the limits on individual autonomy at the end of life. KevinMD: An internal medicine physician, Kevin Pho founded and edits this blog, where more than 2,000 primary care doctors, surgeons, specialist physicians, nurses, medical students, policy experts and patients have shared insights and commentary. Medicare Rights Center: This national nonprofit consumer service organization publishes very useful information about Medicare news as well as a twice-monthly e-newsletter, “Dear Marci,” which answers consumers’ questions about Medicare coverage. Mesothelioma Guide–All about hospice benefits for people struggling with mesothelioma here. Mesothelioma Symptoms: This site offers free resources and services for veterans dealing with the cost and treatment of mesothelioma. OK to Die: Monica Williams-Murphy, MD, is an emergency room physician whose mission is to help people plan ahead, make their peace and understand that it is OK to die naturally and make educated choices so they can die peacefully and comfortably. Order of the Good Death: Droll, bemused yet with great heart, Caitlin Doughty, a mortician, talks all things death-related in her blog and videos. She is great company. Pallimed: A Hospice and Palliative Medicine Blog: This blog tracks notable articles relevant to palliative care from a variety of journals but also includes reviewing media coverage of hospice and palliative care issues. Pulse – Voices from the Heart of Medicine: An online narrative medicine publication, Pulse publishes a personal story of illness and healing, told by and for health care professionals and non-professionals alike, every Friday. It also publishes art and poetry. Sunrise Rounds: Health & Medicine Through the Eyes of a Medical Oncologist: Often eloquent, always informative and thought-provoking, James C. Salwitz writes movingly about advanced serious illness, caregiving, the health care system and end-of-life issues. Gentle Yoga For Seniors: These videos, from the website http://www.sixtyandme.com, offer gentle exercises for both beginners and experienced yoga devotees.